The spinal cord needs adequate space inside the spinal canal. The spinal canal is a protective ring of bone that surrounds the spinal cord. Conditions such as fractures, dislocations, tumors, or degenerative changes in the discs and joints of the neck can put pressure on the spinal cord. This is due to the protective ring of bone around the spinal cord, which does not expand to accommodate more space. Extra pressure within the confined space of the spinal canal can place the entire spinal cord in danger. Surgery to open the back of the spinal cord is one way to relieve pressure. This procedure is called laminectomy. 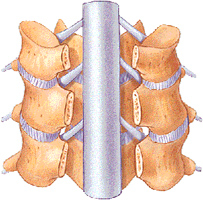 The vertebral body is a column of individual bones that make up the spine (spinal column). Each level of the spine protects the front of the spinal cord. The pedicle and lamina bones form a protective barrier that surrounds the sides and back of the spinal cord. The pedicles connect to the vertebral body, while the lamina bones attach to the pedicles. The lamina bones cover the back surface of the spinal canal, forming a protective roof over the spinal cord. Removing the lamina gives more room for the spinal cord and spinal nerves, while also relieving pressure. Surgeons may remove bone spurs which are causing irritation and inflammation around the spinal nerves. Removing the entire lamina in the cervical spine may cause problems with stability. If the facet joints are damaged during the laminectomy, the spine may become unstable and cause problems later. One way that spine surgeons try to prevent this problem is by cutting one side of the lamina and folding it back slightly, instead of removing the lamina completely. The other side of the lamina opens like a hinge. This makes the spinal canal larger, giving the spinal cord more room. The cut area of the lamina eventually heals to keep the spine from tilting forward. You’ll be able to get up and begin moving within a few hours after surgery. Your doctor may have placed you in a neck collar. Limit your activities to avoid doing too much too soon. Most patients are able to return home when their medical condition is stabilized, usually within a few days after surgery. Your doctor may have you attend physical therapy beginning four to six weeks after surgery. A well-rounded rehabilitation program assists in calming pain and inflammation, improving your mobility and strength and helping you do your daily activities with greater ease and ability. Therapy sessions may be scheduled two to three times each week for up to six weeks.